Sorry about all the questions, but really, it's as if 50% of my .package files have issues, even though I think I try everything I need to, or at least what I know to try. I've worked with a mirror before just to try to get the reflective surface on another object, but this is the first time I try to make an actual mirror, and I don't know why, but I thought it would be easy. So far, I have tried with two different base game mirrors, both with different cuts (3 and 4) and I cannot get the actual mirror part to reflect. The funny / odd thing is that a part of the mirror that doesn't technically exist (the inside edge of the frame) is what is reflective in-game. I cannot understand why, as the cuts are correct (original mirror cut 2 to new mirror cut 2; original mirror frame cut 3 to new mirror frame cut 3). In looking through the site for help, I came across this thread: Mirror Problem Solved and this is the same issue I seem to be having, but I have just little planes, so not sure what is happening. Any help would be appreciated. Maybe? (Keeping fingers crossed...) Cheers! edit: Upon looking closer at the UV layout for cut 2 (the mirror), I see multiple instances of 'stray', overlapping tri's, which *may* be a factor in the game engine's ability to render it correctly... Might want to 'Smart Unwrap' and Save As a Copy to check if it plays nicer with a fresh UV. I normally do apply decimate correctly, or at least I think I do. When I go back to decimate some more though, I see that the decimate is still open as an option (although it has no amount set). Not sure what that is about or if I should have worried about it until now that you mention it. Normally I just click the little 'x' to close it out then apply it again through modifiers. I will keep an eye out to see if it closes out correctly from here on in after I click apply. As for the uv unwrapping, I have unwrapped it several ways, and still, no reflection. I've also triangulated the mesh and I'm not sure if on this one, but on one of them, I used Edge Split just to see if that did anything. I have flipped the normals too, and still, nothing. On one of them, I even added a back, and that just made the entire mirror gold (I had used a gold texture). As for armature, I am almost embarrassed to say that I don't know what that is. I will look for threads or tutorials on it. I *know* that you make CC. I have been making Sims 4 CC since the release of Studio (have never used TSRW for anything other than 3 to 4 extraction). Your not knowing immediately about Armature, yet having made successful CC has made me wonder if it is necessary, however I am not going to abandon using the modifier wither way (as I said, hard-coded into me). The Armature modifier can be seen on the s4studio_mesh_0, it is found on the same tab as the Decimate modifier. One chooses to add the Armature modifier, then changes the Armature name in the box to s4studio_skin (or like that, cannot recall without looking, as I always copy/paste the name), and binds it to the rig. 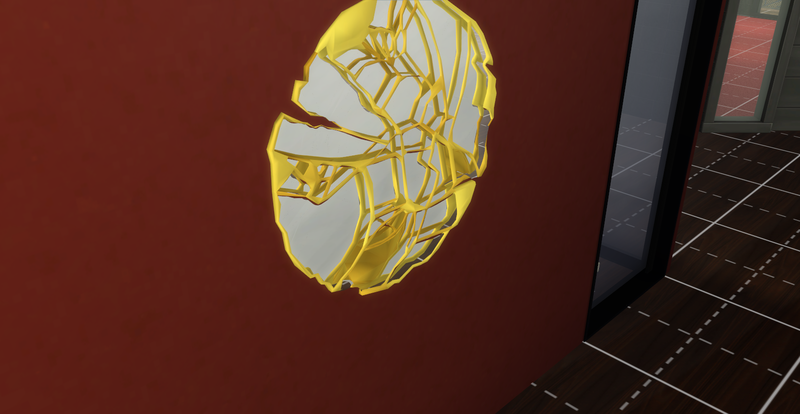 As a last-ditch effort to make the mirror, I was going to suggest that you clone the round mirror from Spa Day, if only for the actual mirror surface, which is a round item (even knowing that your frame wants to look as if it has a 'cracked' edge. Normal flipping is also a suggestion that I would have made, however you have already thought of that yourself and tried it, to no avail. One way or another I am sure you will succeed! Cheers! Thank you, Mini. I honestly am so appreciative of the amount of KNOWLEDGE - one of the richest assets anyone has, but meaningless if not shared - each of the people who help others on this website is so open to share with us. You especially, along with a couple of others, kindly take the time to actually LOOK at our files, our issues, and to provide in-depth responses which help immensely. Again, thank you for that. I kind of set the mirror aside, but as I am working on an entire Boca do Lobo set, would love to have it, so I will definitely try both other mirrors and adding an armature to the one I was working on.